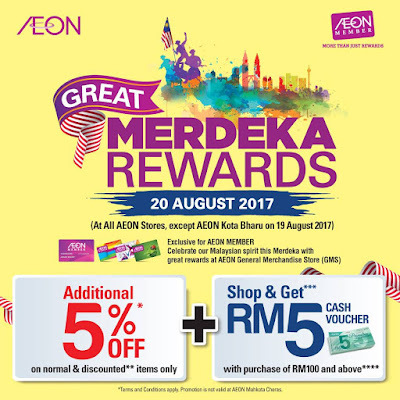 Come celebrate our Malaysia spirit with AEON MERDEKA REWARDS! In Commemoration of the meaningful day of Merdeka, we here at AEON are having a special promotion to celebrate our unique Malaysian spirit! So, come shop with us on 20th August 2017 at all AEON Stores (except AEON Kota Bharu on 19 August 2017) to enjoy additional 5% OFF and get RM5 Cash Voucher when spending at AEON General Merchandise Store (GMS). Not valid at AEON Mahkota Cheras.